▪ Proceed to Room 208, King Edward Court, Stuart Street. Do not pass GO. Do not collect $200. ▪ Rent: Please pay $2 per family. Members get a FREE turn. 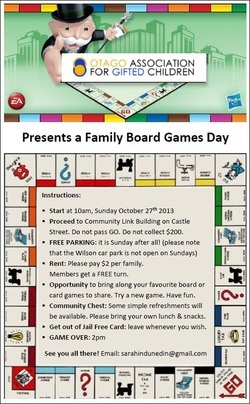 ▪ Opportunity to bring along your favourite board or card games to share. Try a new game. Have fun. ▪ Community Chest: Some simple refreshments will be available. Please bring your own snacks. ▪ Get out of Jail Free Card: leave whenever you wish.